Are you thinking of going to eXtreme365 Dubrovnik? We’re going, and we think you should. If you want some great Dynamics training, meeting key Microsoft staff from the US and EMEA, networking with lots of Dynamics partners, consultants and end users, all in the beautiful setting of Dubrovnik, Croatia, then you should go. New ISV and Dynamics Platform training courses. You’ll see familiar and new subjects. Here’s the list of courses. If you register before February 16th you’ll receive a €200 discount on the standard (normally €1495) or the premium executive exchange (normally €2195) registration. Simply use the code MSDYN365 when registering. This offer only works for new registrations. 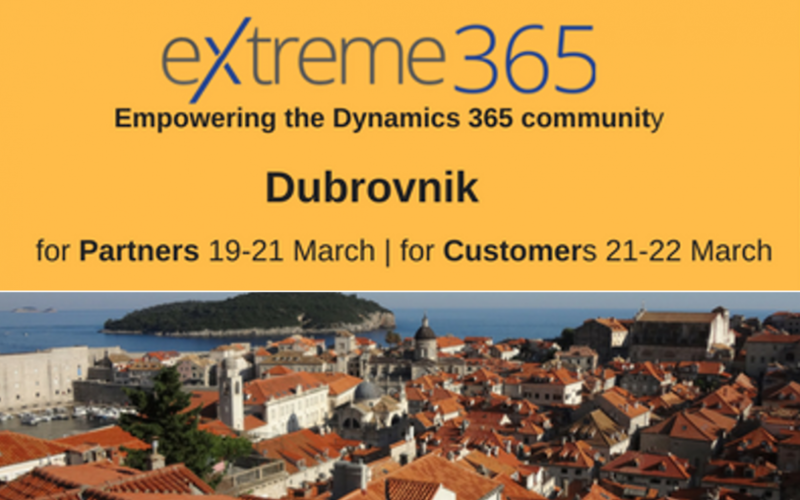 Also, if you know any Dynamics users who would benefit from the eXtreme365 Dubrovnik for Customers track they can also receive €200 off their customer event registration through Feb 16th using code MSDYN365. eXtreme365 Dubrovnik is an action-packed event, and we are always impressed by the high quality speakers, education, and catering 😊 that the team put on. It would be great to see you there.